We arrived in Reykjavik from the airport on a gloomy Sunday afternoon. After temperatures in the 70s (F) in Amsterdam, it was no surprise to find the weather a good bit colder in Iceland. Our driver dropped us off at the back door of the Radisson Blu 1919. As there was road construction on one corner we couldn’t tell the building was as pretty as some other photos of it that I’ve found online. In 1919 the first steamship company in Iceland was formed and its headquarters were in this building – thus the 1919 in the hotel’s name. We only stayed here one night prior to moving to the hotel that was included in our tour. The lobby had lots of dark wood and fairly low ceilings. I didn’t get photos of it but the impression that remains is that was a bit gloomy. The restaurant is also on this floor. We took a look at their menu but decided to eat elsewhere for our one breakfast. Our room was on the second floor at the end of a hall. While it didn’t have connecting doors, the door to our room and another room were behind another door so I wondered if that “master” door was essentially their way of joining the two rooms. I recall the Hilton on Maui having a similar setup. Even though we had booked twin beds, when we arrived the twins were pushed together as a king. 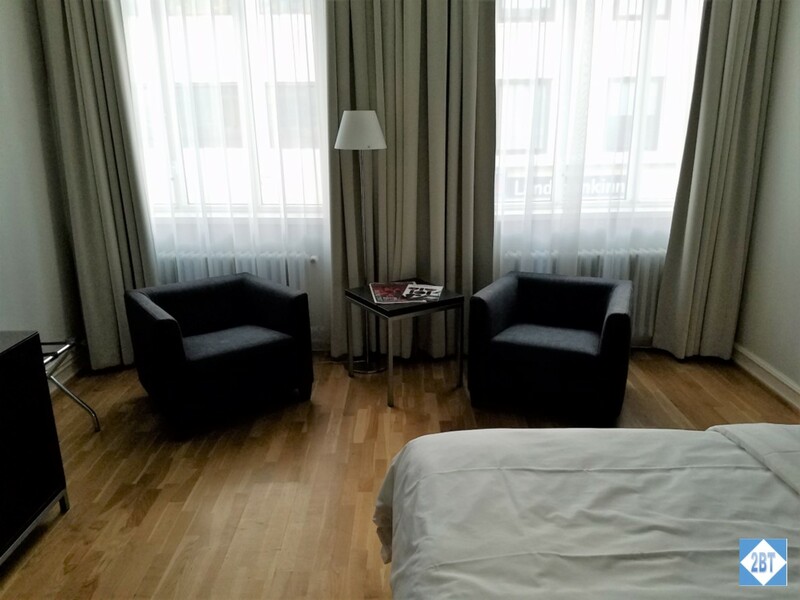 After notifying the front desk, a housekeeper cam right up to split the beds and even moved one of the night stands in between the two beds. Before she left I got her to leave me an extra sheet that I could use as a top sheet under the duvet. I was hoping that would keep me from getting so hot at night. I think it helped some but we did leave the window cracked just a tiny bit and I think that had a bigger effect. I had no problems with the mattress and there was an outlet over each nightstand – at least when the beds were arranged as a king and the nightstands were on the outside. Our room was nice and big, even by American standards, much less compared to typical European rooms. At the far end were two large windows with radiators beneath them and two comfortable chairs with a side table and a light in between them. Across from the beds was a single piece of furniture that doubled as the desk and as the cabinet for the mini-fridge. 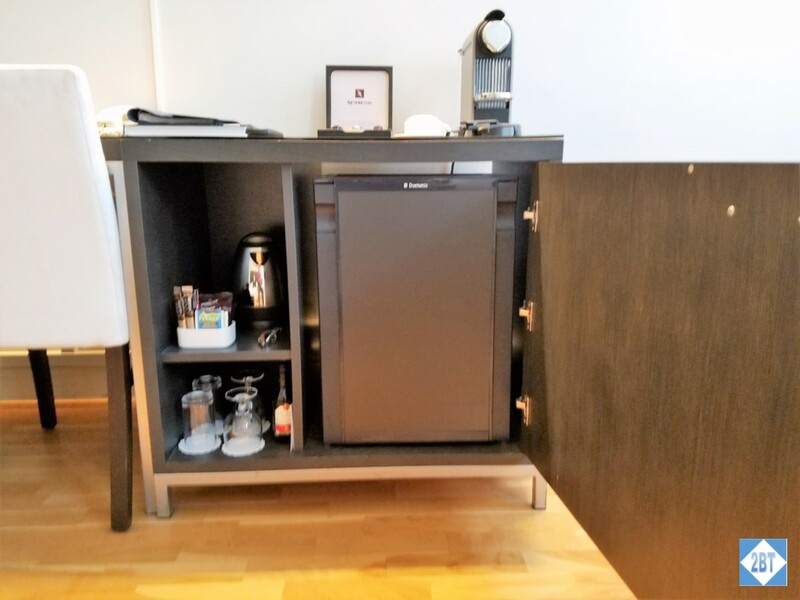 The coffee/tea machine sat on top and the TV was wall-mounted over it. Two complimentary bottles of water were also provided. Inside the cabinet were glasses and the teapot, along with the mini-fridge. Just to the left of the desk was the wardrobe. Robes and slippers were provided as was an iron and ironing board. The safe was down quite low on a shelf. The bathroom was also large with tons of counter space on either side of the sink though no storage area below. 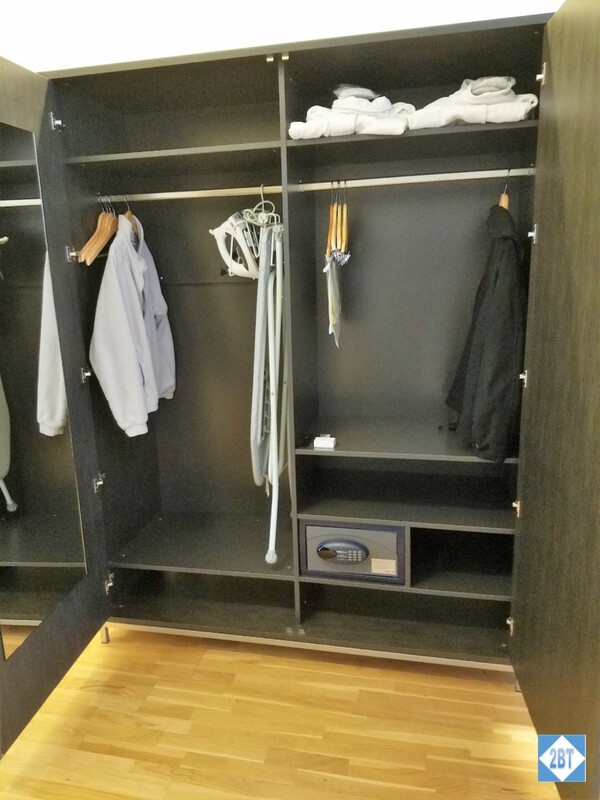 But if you were staying for awhile, you could easily store empty suitcases in here. 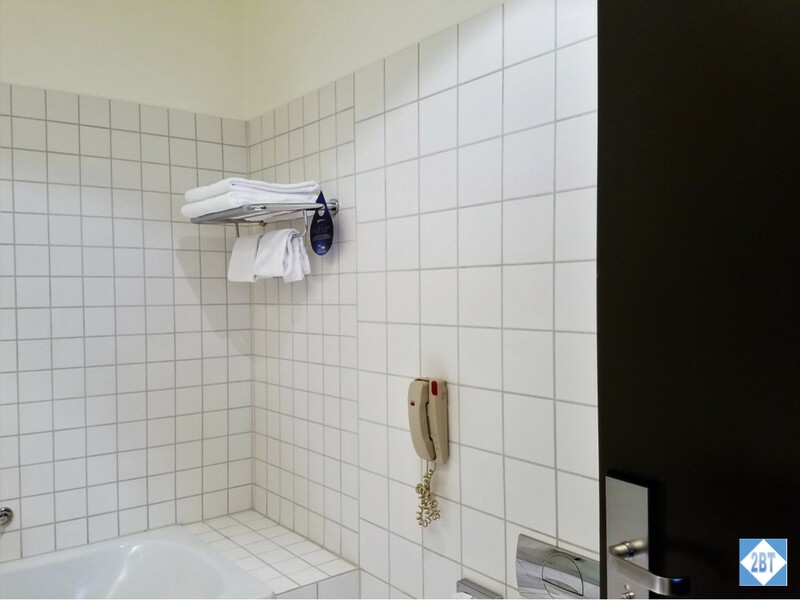 The toilet was across from the sink and the tub was at the far end of the room. While I liked the extra tiled area at the back of the tub, it was quite narrow and, as is common in Europe, was a bit of a step to get into/out of it. As you can see, there was no shower curtain, just the wretched 1/3rd panel of glass. Grr! I hate those things. 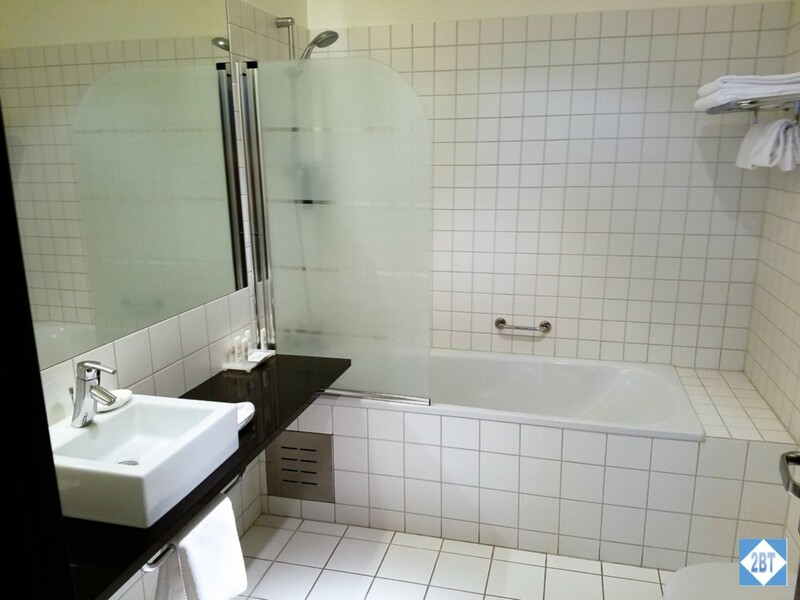 Over the extra tiled area at one end of the tub was a combination shelf/towel rack with plenty of towels. 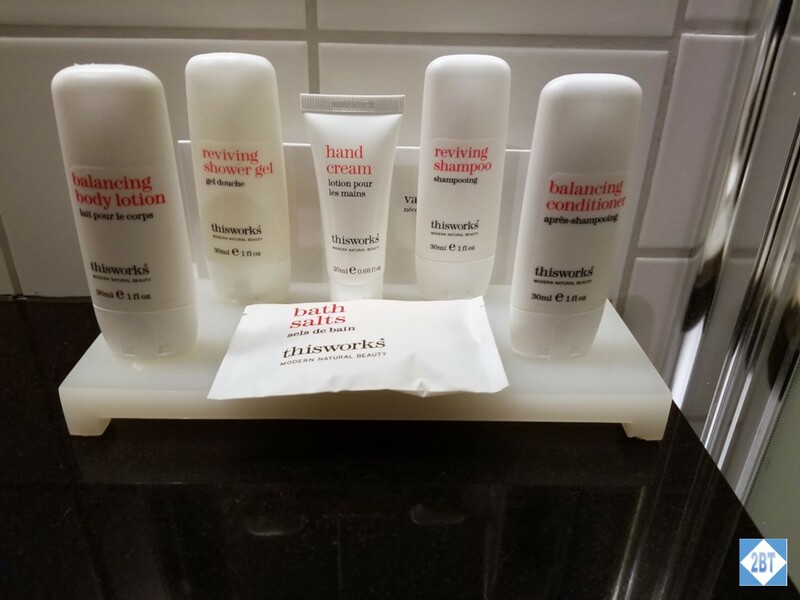 The toiletries were by thisworks and I really liked them. I took them with me to our next hotel which proved to be a good idea. I had a bit left over when we left Iceland and found they didn’t work quite as well without the fantastic Icelandic water. 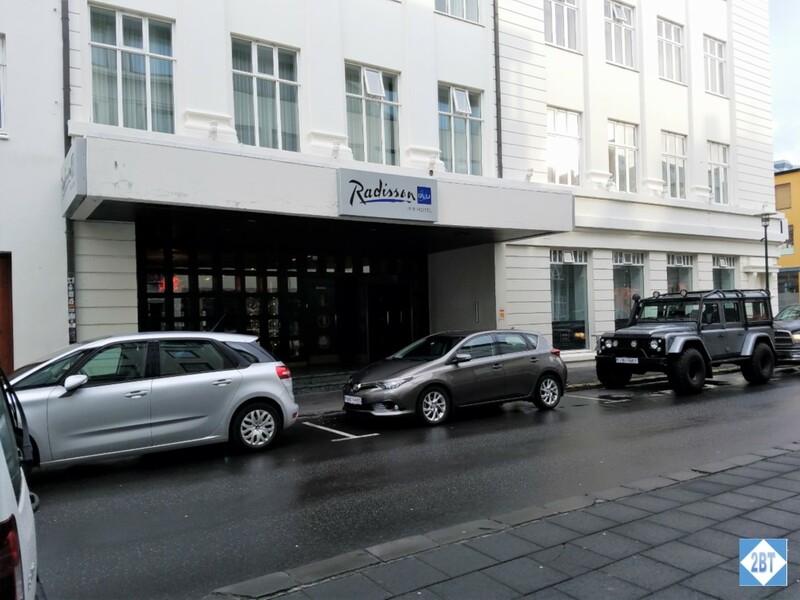 The hotel is super-convenient to old town Reykjavik and all the tourist things in and near the city center. 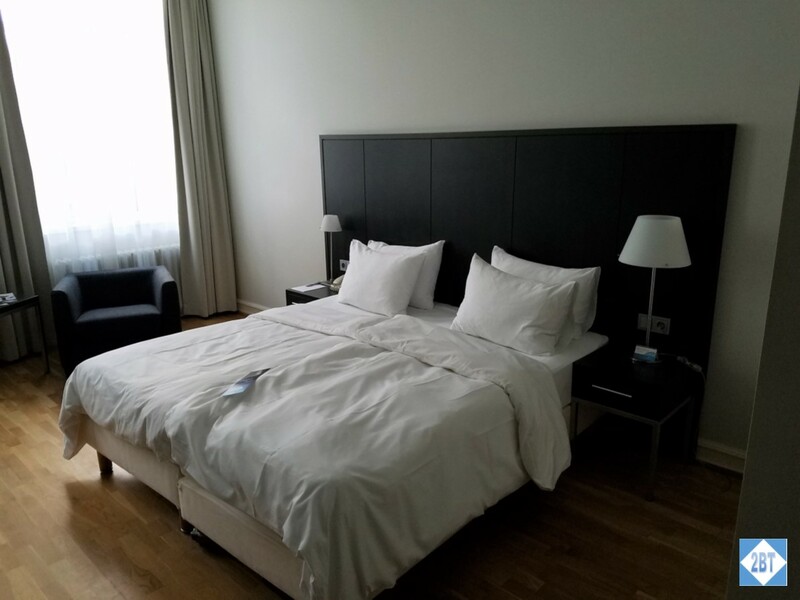 We used 70,000 points for the one night vs. a pre-paid rate of about $230. We stayed during what appeared to be the last week of high (or maybe just “higher”) season – the second weekend in October – as the next weekend the room was only 44,000 points. 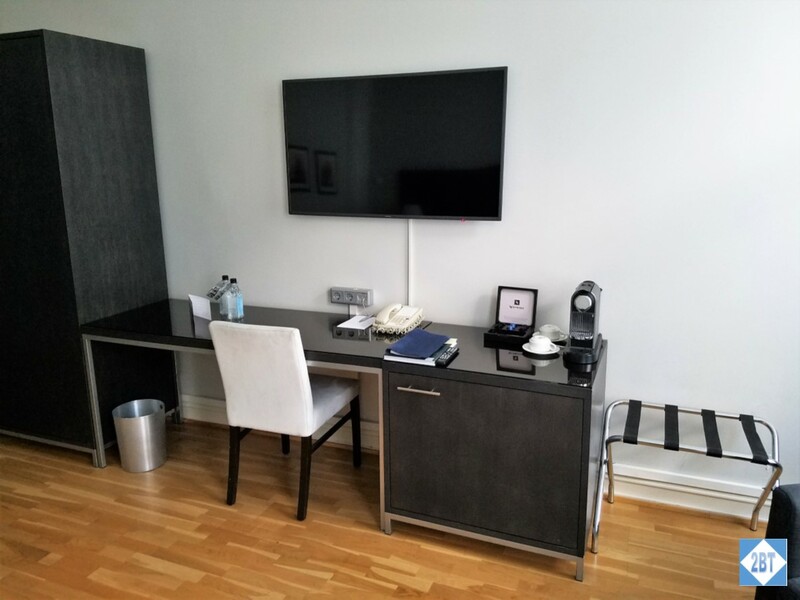 But the room and the bathroom were large, it’s got a great location, our interactions with the staff were pleasant and the one issue we had was quickly rectified. I wish our tour group could have stayed here instead. I’d be happy to stay here again on another visit to Iceland.